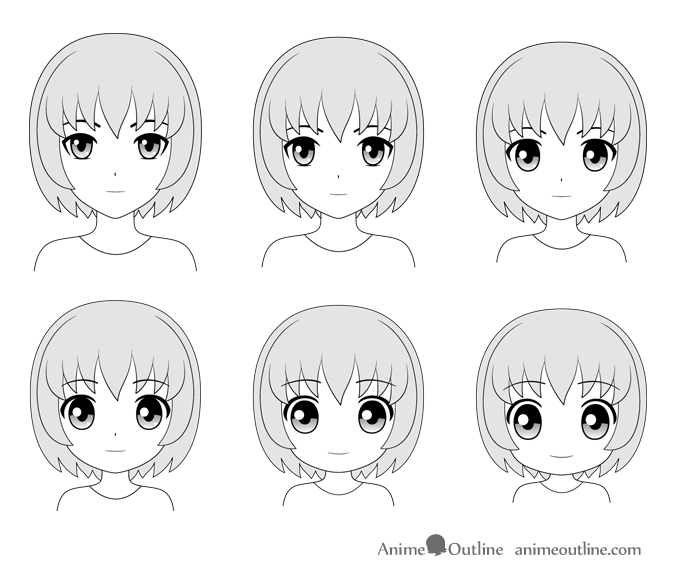 This tutorial looks at how to draw different types/styles of anime and manga heads and faces going from the more common styles to the more stylized (also known as “Chibi”). Below are some basic examples of the same character drawn in different styles along with an explanations for what makes them different from one another. 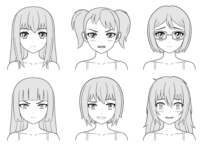 The above styles are similar to those commonly used in anime and manga. Usually these have body proportions that are are fairly close to those of real people. 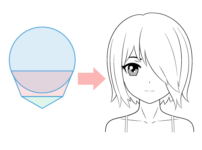 Style is not the only thing that effects the shape and size of anime heads. The characters age is also important. Kids tend to have rounder faces and heads bigger in comparison to the rest of the body. 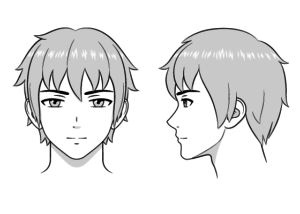 The more stylized example of anime characters tend to have bigger eyes and rounder chins. More stylized characters also tend to have heads that are bigger in relation to the rest of the body than in real people. Chibi characters are very stylized. They tend to have very wide faces, rounded chins and huge eyes while the nose is often not drawn at all. 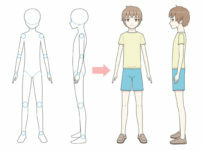 These types of characters also usually have heads that are giant compared to the rest of the body. 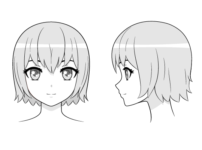 In the above example you can see the difference between the various styles of anime heads. 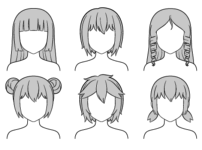 As already mentioned the more stylized faces are generally drawn wider and have more rounded chins. 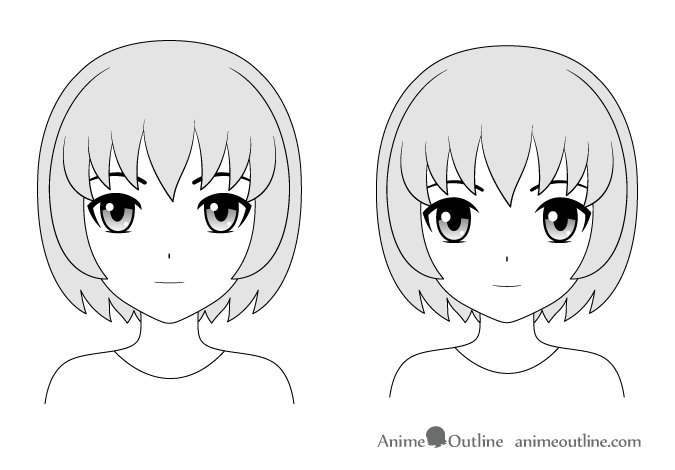 The above illustration shows how anime facial features tend to change based on style. 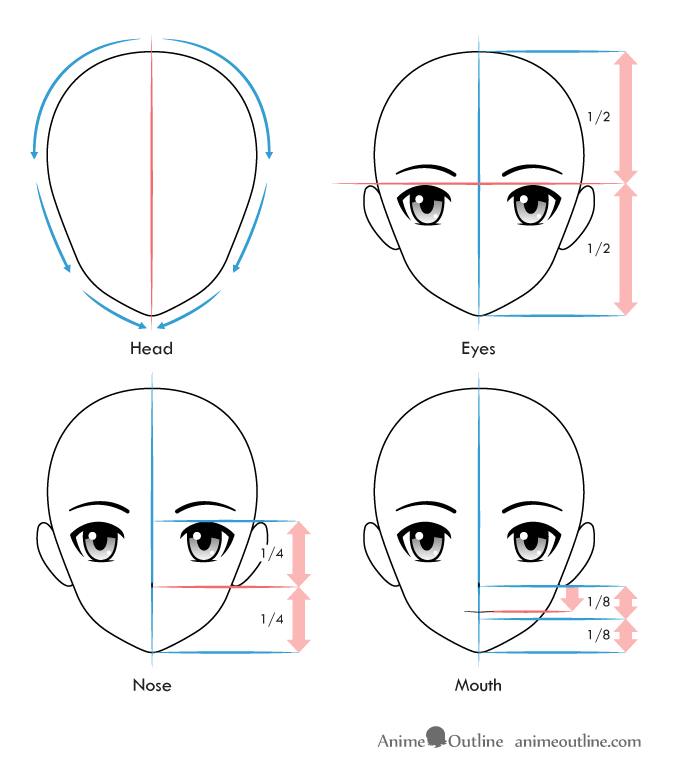 When drawing the facial features for the first three examples you can use the guidelines provided below. For very stylized characters like the last three examples these guidelines may not always apply. 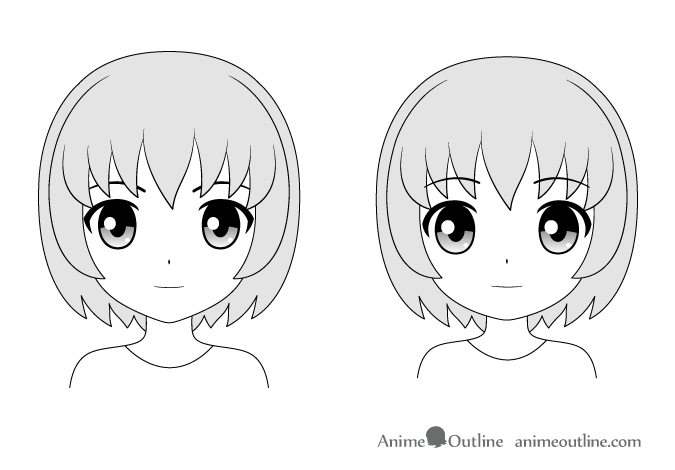 When drawing “Chibi” characters you can draw the mouth and nose lower down than the below example. As these types of characters can be very stylized it’s hard to have a clear guideline for drawing them. Draw a vertical line through the middle of the head to help you place the facial features more evenly on both sides of the head. Draw a horizontal line through the middle of the head and draw the eyes below that. Draw the nose halfway between the middle of the face and the chin. Draw the mouth slightly above the halfway point between the nose and the chin. 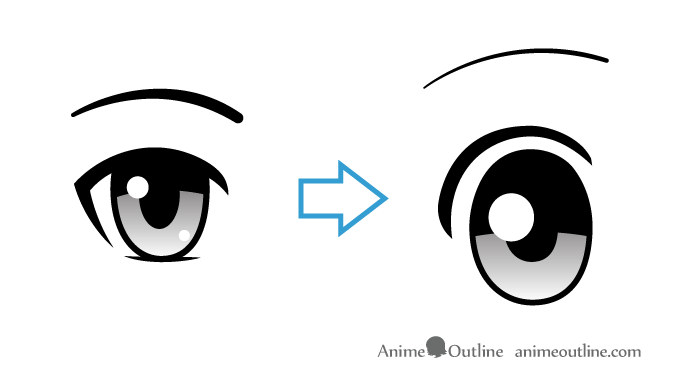 For more serious styles of anime eyes you can draw them closer in shape to real eyes (although still much larger). 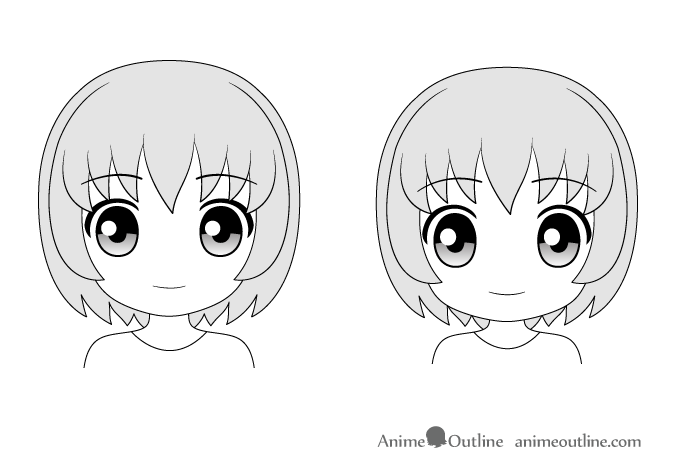 For “Chibi” faces draw the eyes larger and “taller”. You can also avoid drawing the bottom eyelashes. 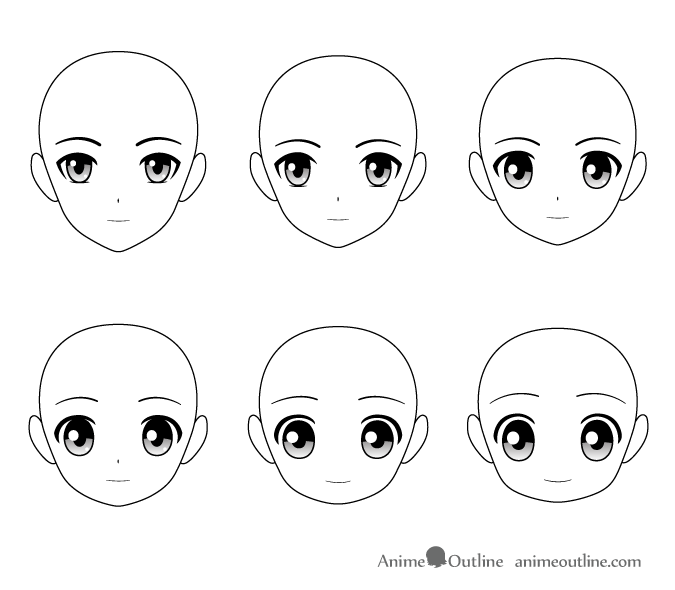 For less stylized anime and manga characters you can draw the eyebrows covered by the hair (if the hair goes down that far). For more stylized characters draw the eyelashes right over top the hair. In the very stylized chibi faces you can avoid drawing the nose all together. 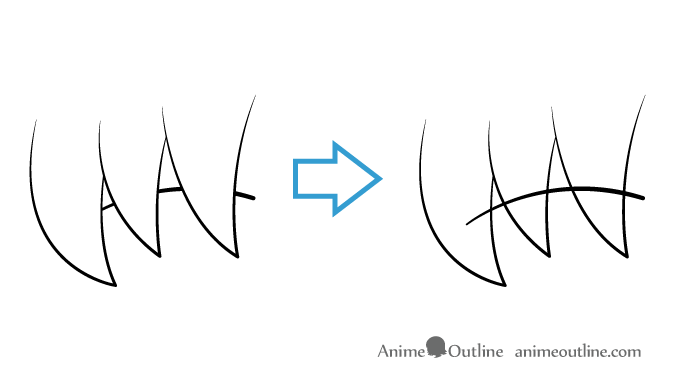 You can draw the mouth pretty much the same across most styles (single line). 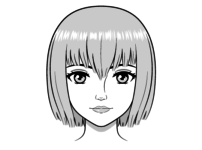 Though in some very realistic anime styles or if the character is wearing lipstick the mouths are drawn slightly different. 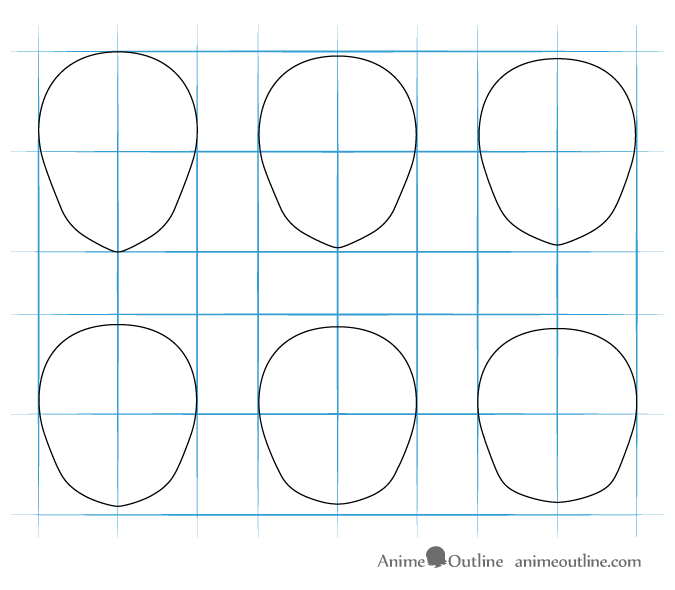 This tutorial covered some of the basics of drawing different styles of anime faces but obviously there are a lot more styles and variations out there. You can experiment combining different aspects from different styles and see what you can come up with.